Pak Army is one of the prestigious institutes of the Islamic Republic of Pakistan. People crave to become part of Pak Army in order to be among those who are the defenders of pure land of Pakistan. Moreover, from the religious point of view, it is one of the noble duties that one can perform; defending your motherland has high respect in Islam. This is why martyred is awarded high rewards in hereafter life in Holy Quran. Many of the youngsters are determined to be the part of Pak Army but the problem lies in their half or zero knowledge of doing so. Today this article is dedicated to those lads who want to join Pak Army as commissioned officers. HOW TO LOOK FOR ISSB REGISTRATION DATES? The registration dates are given in newspapers such as ‘JANG’ and ‘THE NEWS’ by the army. Moreover, you can check the dates on the official website of Pakistan Army i.e. www.joinpakarmy.gov.pk. Keep visiting the site, you will see the notification as it's being shown. 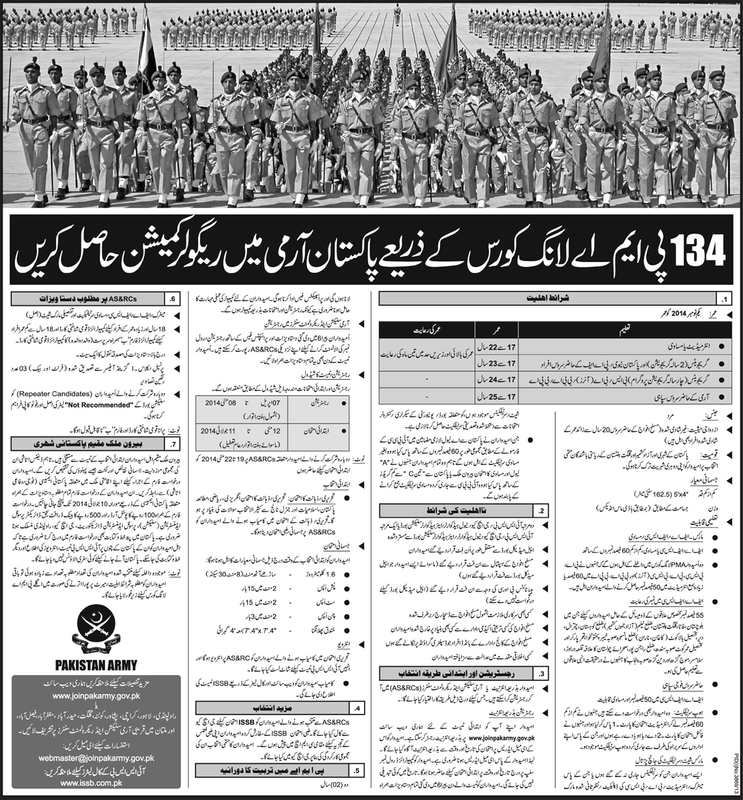 Here’s an ad from a newspaper showing the registration dates of PMA long course. Every time similar ad appears in newspapers with recent dates. Selection centers are always mentioned in advertisement and for online registration, the official website of the army is provided as well. ARE YOU ELIGIBLE FOR ISSB APPLYING? Before discussing the whole procedure, let us talk about the eligibility criteria set by GHQ. Serving Pakistan Navy and Pakistan Air force personnel can also apply. BS/BA HONS, BBA/BPA degree holders can apply. Army does take care of the soldiers and provide them with equal opportunity of becoming a commissioned officer of 17th grade by applying for PMA L/C. They are given maximum age relaxation. Only males can apply for 2 years long course. The candidate should be unmarried. The candidate must have Pakistani nationality or that of Azad Kashmir and Gilgit/Baltistan. Dual nationality upon selection of a candidate for long course is not acceptable. The applicant has to surrender other nationality before stepping into Pakistan Military Academy, Kakul. Height should be 5.4 feet or 162.5 cm and the weight should be as per the Body Mass Index. Candidates from backward areas are granted special relaxation in FSc/FA marks. They are eligible with 55% marks. These areas, in particular, are Chitral, Tehsil Bala Kot, Kohistan, District Rajanpur, Area Of Cholistan Desert, Drawer Fort, Salamsar, Mojgarh And Dingarh Of Punjab. They are given relaxation in FSc marks. Their marks should be 60%. It is for those candidates who have to appear in Part 2 exams of intermediate. If they have 60% marks in Part 1, they can get a ‘hope certificate’ from the head of the institution and apply for registration. Those candidates who have cleared A levels, they need to apply for equivalence certificate from IBCC. WHO IS INELIGIBLE FOR ISSB REGISTRATION? 1. If the applicant is twice rejected by ISSB, GHQ, NHQ, and AHQ, he is disqualified for recruitment in PMA long course. 2. Those candidates who are declared UNFIT permanently by Appeal Medical Board cannot apply for the registration. 3. Candidate rejected due to hepatitis B and C.
4. Applicant removed or dismissed from Government Services including Armed Forces. 5. Applicant withdrawn from any Academy/Training institution of Armed Forces is ineligible for Long Course. 6. Applicant removed or expelled from any Army bonded college or institute on disciplinary grounds. 7. Candidate convicted in the Court of Law for any offense involving moral turpitude. WHAT IS THE REGISTRATION PROCEDURE FOR ISSB? Candidates can get themselves registered via Army SELECTION AND RECRUITMENT CENTRES AND INTERNET. The candidate is supposed to visit the official website of Pak Army i.e. www.joinpakarmy.gov.pk and get himself registered there. The candidate is bound to bring all required documents on the date of test given on computerized preliminary roll number slip to nearby selection center. Candidate will pay prospectus fee before the test and must have basic working computer knowledge for undertaking the preliminary test. When you visit the website for registration, the current PMA LONG COURSE appears there with a little description underneath (it will show only when registration will be announced via newspaper, keep visiting the site after one week). Click on a link which says ‘CLICK HERE’ for registration. This ‘CLICK HERE’ is marked red. You can easily find it on the home page. When you click it, a registration form is opened. Section A of the form contains ‘PERSONAL INFORMATION’, section B is all about your ‘EDUCATIONAL DETAILS’. It has 5 further sections asking for your MATRIC, PART- I, PART-II, BACHELORS and OTHER QUALIFICATION information. After filling all the required fields, you click on an agreement for providing all authentic information. There are two buttons on the bottom right side of the page saying ‘RESET’ and ‘REGISTER’. If you have provided all essential and true information, click on registration. After registration, you are provided by tracking ID on your provided email account. Through this tracking ID, you are given your ‘TEST CENTRE AND DATE’. For obtaining your exam slip, you will be asked to enter your CNIC. After entering your CNIC, you will click on ‘CHECK STATUS’ icon to check whether your application has been approved or not. If it has been approved, you will simply download your exam slip and report on respective selection center for the test. This is how you get yourself registered online. For this candidate should simply visit nearest selection center with all required documents and prospectus fee for completing registration formalities. Their registration would be done manually and roll number slips will be allotted to them. b) Computerized national identity card for those who are 18 and computerized ‘B’ form for age less than 18 years along with a photocopy of computerized identity card of parents (mother/father) or that of a guardian. c) One set of attested copies of documents mentioned in (a) and (b). d) 3 duly attested (front and back) passport size colored pictures with a blue background. Pictures should be attested either by the principal or by CLASS-1 Gazetted officer. e) Repeated candidates will bring original as well as one photocopy of ‘NOT RECOMMENDED’ letter by ISSB. Old CNIC and ‘B’ form will not be accepted at all. Repeater candidates are given special dates of reporting and nearby selection center for preliminary tests. They will bring their ISSB letter of non-recommendation. An important thing to note here is that those who had been rejected in ISSB for TECHNICAL CADET COURSE (TCC) will also be considered repeaters. HOW IS PRELIMINARY SELECTION DONE IN ISSB? • Multiple choice questions are given from 5 subjects i.e. Maths, Pak Studies, Islamiyat, General Knowledge and English. • Those applicants who clear written test qualify for physical and medical tests. Those candidates who will pass initial written and physical test, they will be shortlisted for ISSB once they get through an interview held at AS&RCS. Call up letters will be sent to successful candidates for ISSB. They could be sent letters through website as well. FURTHER SELECTION: Candidates recommended in ISSB will be examined thoroughly again for a medical test by nearby CMH. The final selection is done at GHQ on the basis of overall performance of the candidate. WHOM SHOULD YOU CONTACT FOR ISSB FURTHER QUERIES? 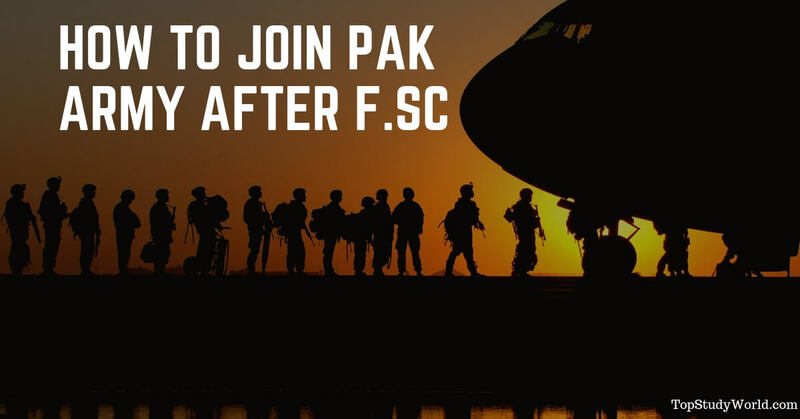 Are you interested to join the Pak Army after F.Sc? Here you will find complete guide for joining ISSB.